Your employees. Their health plan. Our business. Gateway Health is pleased to announce our partnership with the Medical Society of Virginia Insurance Agency (MSVIA). We’ve selected to partner with MSVIA based on its reputation for providing outstanding service and a full range of insurance coverage options. Gateway Health encourages you to contact MSVIA for a no-obligation consultation. If you have questions or wish to obtain a quote, please contact MSVIA toll-free at 877 | 226-9357 or use the online quoting tool at www.msvia.org. Talented, dedicated, professional work staff whose sole goal is to service the needs of the physician community. MSVIA staff has well over 100 years of combined experience working with medical malpractice insurance, both on the agency side and the company side of the business. The agency has access to six quality malpractice carriers that have proven their commitment to doctors in Virginia by providing coverage to doctors in both hard and soft market cycles. These include 3 of the largest national carriers in the country. These companies are large enough to meet the changing needs of the group as it continues to grow. As a full service agency, the MSVIA can assist clients with all business insurance needs including health, workers compensation, property, general liability, regulatory and billing, cyber liability, management liability etc. The MSVIA makes a proactive service commitment to its clients that will be tailored to the needs of the insured and presented to the insured in writing. The MSVIA serves the Medical Society of Virginia as a source of non-dues revenue. After agency expenses, the profits earned by the MSVIA are paid to the MSV. These funds help to provide MSV services, to physicians, and to fund MSV initiatives in support of Virginia physicians. Connection to the MSV keeps MSVIA informed regarding issues important to physicians and issues related to the professional liability environment in Virginia. This knowledge is shared with MSVIA clients. MSVIA endorsed by the Richmond Academy of Medicine, Arlington County Medical Society, Chesapeake Medical Society, Virginia Beach MedicalSociety, the Norfolk Academy of Medicine, the Roanoke Valley Medical Society and the Prince William Medical Society. MSVIA was created by physicians for physicians. The agency’s board of directors is comprised of physicians, practice managers and insurance professionals who have experience with and knowledge of the real challenges you face. 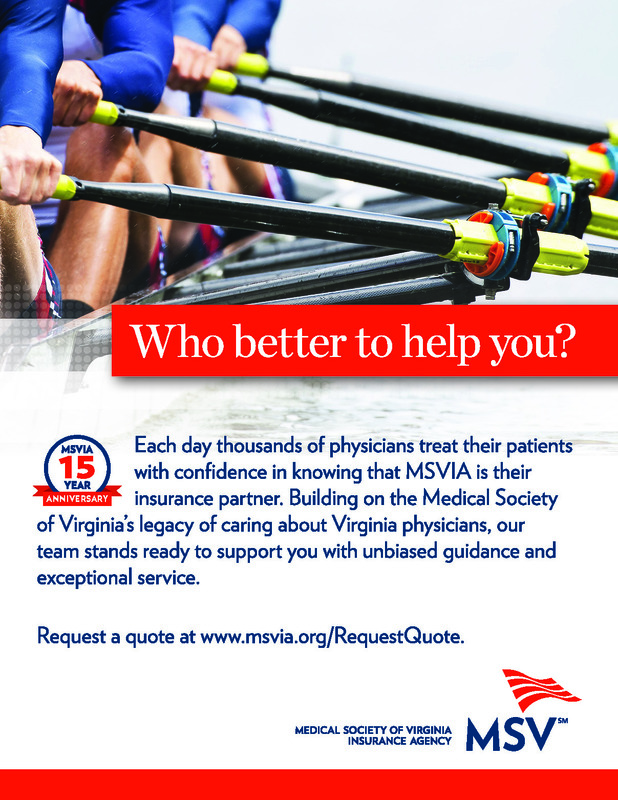 As a wholly owned subsidiary of the Medical Society of Virginia (MSV), MSVIA’s revenues benefit Virginia’s physicians by supporting legislative advocacy, practice management guidance and other initiatives. Experience:MSVIA celebrates more than 15 years of serving the physician community, with a professional staff possessing more than 300 years of combined insurance experience. Quality: MSVIA offers access to top national providers of health, life, disability, dental, professional liability and other property and casualty coverage. Focus: MSVIA focuses on advising physicians and their practices with a commitment to finding the highest quality coverage for the best value. Healthy Solutions by Gateway Health Alliance, Inc. Copyright © 2011 Gateway Health Alliance, Inc. All Rights Reserved.